What is Idrasil™? It’s Simply Medicine. Idrasil™ provides all of the medicinal analgesic & therapeutic benefits of Medical Cannabis without the social risks associated with smoking or the unpredictable dosages of edible confections. Idrasil™ eliminates the negative social stigmas associated with Medical Marijuana and replaces them with a mainstream ALL NATURAL NUTRACEUTICAL which looks like any other pill on the market. Cannabinoids are the active components of Cannabis. Tetrahydrocannabinol (THC) & Cannabidiol (CBD) are the most prevalent natural cannabinoids and have received the most study, however, Idrasil™ contains over 65 cannabinoids. Unlike Marinol (Dronabinol), which are synthetic forms of a single cannabinoid (THC) only, Idrasil™ is an all-natural cannabis plant extract containing the full spectrum of naturally occurring cannabinoids (cannabis). Extraction: Our proprietary technology effectively isolates all of the cannabinoids from the cloned cannabis plant resulting in a PURE NATURAL EXTRACTION. Consistency: In the past, the unreliable efficacy and inconsistent dosage of medical cannabis have been the primary complaints of mainstream physicians and caregivers considering prescribing or recommending of medical cannabis. Idrasil™ allows these physicians and caregivers to provide a STANDARDIZED & CONSISTENT FORMULA with a MEASURABLE DOSAGE (25mg Pill), each and every time to their patients. IdrasilRx™ provides all of the medicinal benefits of Cannabis without the risks of smoking or the unpredictable dosages of edible confections. 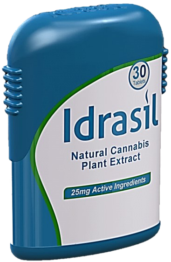 Idrasil™ eliminates the negative social stigmas associated with marijuana and replaces them with a mainstream All Natural Nutraceutical, in a 25mg pill form. Idrasil™ QD, at a bedtime, for Quality of Life. THE ONLY “All Natural” Medical Cannabis Rx recognized and paid for by most health insurance providers in California. Cannabinoids promote homeostasis at every level of biological life, from the sub-cellular to the organism, and perhaps to the community and beyond. Here’s one example: autophagy, a process in which a cell sequesters part of its contents to be self-digested and recycled, is mediated by the cannabinoid system. While this process keeps normal cells alive, allowing them to maintain a balance between the synthesis, degradation, and subsequent recycling of cellular products, it has a deadly effect on malignant tumor cells, causing them to consume themselves in a programmed cellular suicide. The death of cancer cells, of course, promotes homeostasis and survival at the level of the entire organism. Endocannabinoids and cannabinoids are also found at the intersection of the body’s various systems, allowing communication and coordination between different cell types. At the site of an injury, for example, cannabinoids can be found decreasing the release of activators and sensitizers from the injured tissue, stabilizing the nerve cell to prevent excessive firing, and calming nearby immune cells to prevent the release of pro-inflammatory substances. Three different mechanisms of action on three different cell types for a single purpose: minimize the pain and damage caused by the injury. Phytocannabinoids are plant substances that stimulate cannabinoid receptors. Delta-9-tetrahydrocannabinol, or THC, is the most psychoactive and certainly the most famous of these substances, but other cannabinoids such as cannabidiol (CBD) and cannabinol (CBN) are gaining the interest of researchers due to a variety of healing properties. Most phytocannabinoids have been isolated from cannabis sativa, but other medicinal herbs, such as echinacea purpura, have been found to contain non-psychoactive cannabinoids as well. As we continue to sort through the emerging science of cannabis and cannabinoids, one thing remains clear: a functional cannabinoid system is essential for health. From embryonic implantation on the wall of our mother’s uterus to nursing and growth, to responding to injuries, endocannabinoids help us survive in a quickly changing and increasingly hostile environment. As I realized this, I began to wonder: can an individual enhance his/her cannabinoid system by taking supplemental cannabis? Beyond treating symptoms, beyond even curing disease, can cannabis help us prevent disease and promote health by stimulating an ancient system that is hard-wired into all of us? Many physicians cringe at the thought of recommending a botanical substance and are outright mortified by the idea of smoking a medicine. Our medical system is more comfortable with single, isolated substances that can be swallowed or injected. Unfortunately, this model significantly limits the therapeutic potential of cannabinoids.